Happy Birthday, Jackie, and Thank You! 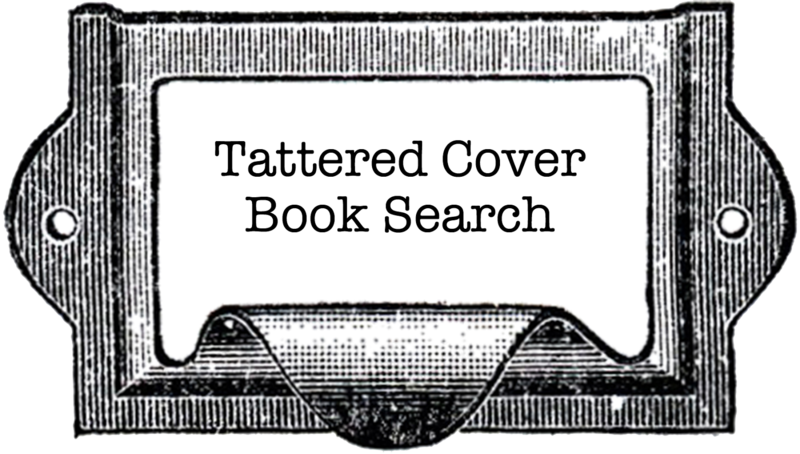 Thank you for your tireless enthusiasm for the Tattered Cover. Every time we see you behind the bar in the LoDo coffee shop, we see you smiling & greeting the customers by name & helping out the baristas! Thank you for all you do to help keep our goodreads site up. Fantastic work! And for tweeting, as well! Thank you for all the blog fodder you send here. The reviews, the links, the reviews, the reviews. How do you have time to read so many books? It's truly an inspiration and a w onder, and something we don't thank you enough for. So thank you! If you, Dear Reader, find yourself in our LoDo store, check out Jackie's Corner. It's on the first floor, near the stairs & the new paperbacks. It's full of her recommendations and reviews (including March's IndieNext Pick: Fool by Christopher Moore!). Look for her in the coffee shop, where she is the manager, and say "hi" and talk to her about books. 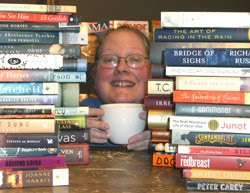 She is a tireless bookseller! And look for more book reviews from Jackie here at Between the Covers, we got three reviews from her this morning! The first thing you come to in this complex book is a quote from Symon Laks: "But words must be found, for besides words there is almost nothing." This thought is central to all of the story lines in this novel of memories, silence and history - both shared and hidden. On the same day that Adam Anker loses his only remaining family, a teenage daughter, he finds an obscure lead to his father that takes him on an amazing journey through post-war-torn Europe and it's survivors. Secrets long untold are slowly revealed and truths come to painful light that somehow complete the circle of who Adam is and what he is meant to do in this life. The idea that no true love is ever lost reoccurs over and over again. Mostly told in Adam's voice, there is a brief section where the author says that one of the other characters just "had to be allowed to speak for herself... Nobody else could possibly tell her story." While jarring at first, this change in tone, and the glimpse into years of silence it offers us, is perhaps one of the most moving parts of this emotional book. This book truly spotlights the value of words, especially stories of people, and their ability to bring us closer together and ease our pain. Full of loss, this is nevertheless one of the most hopeful books I've read in some time. In April 2009, author Seth Grahame-Smith will re-visit Jane Austen's classic novel with a horrific twist: Pride and Prejudice and Zombies. The Chronicle Books release will feature the original text of the novel with passages of gory zombie action penned by Grahame-Smith, the author of How to Survive a Horror Movie. The book also features 20 illustrations patterned after the book's original illustrator, C. E. Brock. American publishing companies grapple with the recession, some encouraging reading statistics have emerged in Japan. According to a recent report, ten of Japan's print bestsellers in 2007 were based on cell phone novels--successfully selling about 400,000 copies apiece. The cell phone novel was born in 2002, when the author Yoshi wrote Deep Love: Ayu's Story for the cell phone. The book exploded in popularity, spawning print books, cartoons, and a film. The genre evolved, as authors published short novels in 70-word installments for the cell phone. Here's more from Japan Today: "[One company] has released 40 titles that have sold 10 million copies ... cell phone novels proved that there was a market for females between the ages of 10 and 20, a demographic thought to be apathetic toward reading. According to a recent Mainichi Shinbum newspaper survey, 86% of high school, 75% of middle school and 23% of grade school girls read cell phone novels." Click here for another article on the cell phone novel phenomenon. Sci-fi for those who don't read sci-fi. I love science fiction. Most people look at me funny when I tell them that, like I just admitted I like a good whack on the head every so often. I try not to let on to customers that I really haven't read much that wasn't sci-fi in years. I can't live the lie any more, I love it and I don't care who finds out. I love it so much I'm determined to get people who don't read it, to read it already. Seriously, there is some fantastically good literature hiding in your local sci-fi section. I won't go into a defense of it's literary value, mainly because others have done it better than I ever could (see Stanislaw Lem's 'Micro Worlds' for some good essays on that topic). My only goal is to recommend books that I think could/should have wider appeal. In honor of Black History Month my first recommendations are for my favorite African American authors. First is Dhalgren by Samuel R Delany. This book tore my head apart and left parts laying about for weeks. More magical realism than sci-fi, this is the story of a city in middle America that has been abandoned after a strange and unknown occurrence. Life in the rest of the country is going as normal and many people don't even know what's happening in this small corner of the nation. Gangs and criminals wander the streets while a few remaining citizenry try to continue their lives amongst the ruins of civilization. One of the most powerful books I've ever read. Next is Kindred by Octavia Butler. I feel that many female sci-fi authors have wider appeal than there male counterparts. This is especially true of Octavia Butler (and Ursula K LeGuin, but thats for another blog) and 'Kindred' is no exception. This book follows a modern black woman who is suddenly transported back to the deep south during slavery and saves the life of a young white son of a slave owner. The woman, Dana, keeps getting sent back for longer and longer periods, to help the past but to also save her present/future self. A moving look at slavery and its effects on us as a society and as people. Many book stores don't even shelve this book in the sci-fi section. More later on the wondrousness that is speculative fiction. 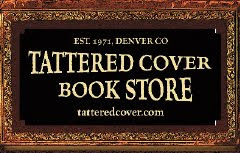 An event of note is happening this Friday at the Tattered Cover Lower Downtown: Boulder journalist Dan Baum will be reading from and singing copies of Nine Lives: Death and Life in New Orleans. Just after Hurrican Katrina Baum moved to New Orleans to write about the city's response to the disaster for The New Yorker. What he found, though, was the far more interesting thing about the city was its people. This book is a multivoiced biography of this dazzling, surreal and imperiled city through the lives of nine characters over forty years and bracketed by two epic storms: Hurricane Betsy which transformed the city in the 1960s and Hurricane Katrina, which nearly destroyed it. This event takes place at our LoDo store, 1628 16th St (at Wynkoop) at 7:30 on Friday, February 20. Oh, and by the way, tonight at the LoDo store Christopher Moore will be reading from and signing his latest novel, Fool. A bawdy retelling of King Lear. It is sure to be a rollicking evening. Free tickets are being handed out at 6:30. For more information, click here. Author Spencer Quinn's first book, Dog On It, just came out a few weeks ago. We've already written about it in our last post, but I want to share a few of the unique ways this book is being marketed. The book is the first in a series of Chet (the dog ) and Bernie (a private investigator). The book is a fun read. The mystery is solid. And Chet could turn into a phenomenon on his own. If you're on Facebook, join the Chet Appreciation Society. He's got his own website and blog at Chet The Dog. And you can follow Chet on Twitter. We're not sure if Chet will be joining Spencer on any promotional tours, but if he doesn't, I bet there'll be some explaining to do! This book is painful and beautiful and bound to be HUGE. Little Bee, a Nigerian girl who fled after the murder of her whole village by oil men, ends up in England searching for the two people she knows outside of Nigeria, two people who helped to spare her life once before. Her appearance back in Andrew and Sarah's life sets off a string of events that changes all of their lives forever--though forever is not as long for some of them as for others. There is horror (some of it graphic) and hope in this novel, and it's told in such a strong, fresh voice--you won't forget Little Bee and her story. Governments at their very worst, human beings at their very best and how they clash--it's haunting. Whew! I told you it was a big week for new releases! Hopefully there's something here for everyone. The Diary of a Wimpy Kid Madness! Thank you to everyone who came to our Highlands Ranch store yesterday evening to meet Jeff Kinney, author of the Diary of a Wimpy Kid series. There were a lot of you! Thanks for making the event so much fun and such a success. 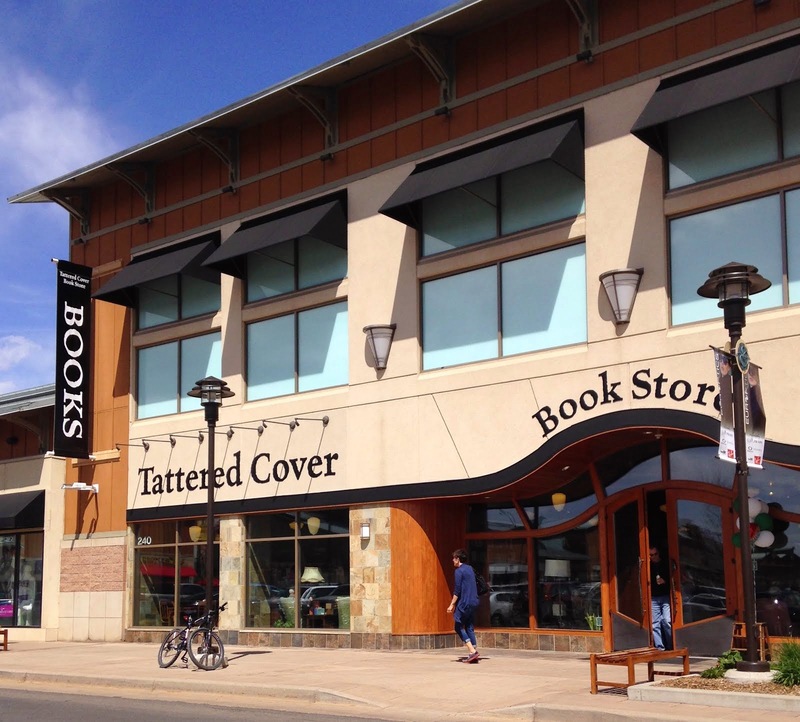 And thank you to all of the booksellers at the Highlands Ranch store. You all rock! In lieu of pictures, I am going to provide a link to an interview with Jeff Kinney that was posted on the Powell's bookstore blog. Powell's is a great independent bookstore in Portland. Click here for the link. What are you doing on Monday, February 9th? Hopefully coming to a Tattered Cover Book Store near you to see one of two fantastic authors! At 6 p.m. on Monday, February 9th, we've got Jeff Kinney coming to our Highlands Ranch store. Jeff is the author of the Diary of a Wimpy Kid books. Free numbered tickets for a place in the booksigning line will be handed out beginning at 5:00 pm. This is a signing only. Mr. Kinney will not be able to personalize books. As he's been travelling around the country, his events have been attracting large crowds. We're very excited to have this late-minute addition to our schedule! Also that evening, at 7:30 in our Lower Downtown store, we've got Eli Gottlieb. Eli is the author of Now You See Him, a staff favorite when it came out last year in hardcover. Now the book is in paperback, and we're glad to welcome him back. For more information on either of these events, or many more, click here to get to our events page. Fay's debut novel takes us through the heartache, confusion, and ultimate renewal of a young widow's first year without her husband. A fluke bike accident leaves Janie widowed with a pre-schooler and an infant to care for in a world gone very dark to her eyes. Festering wounds grow worse when a contractor shows up at the house to build a porch contracted by her husband months before. But slowly Janie comes to see that help is there for her: her crazy aunt actually gets her involved in some good ideas, the young priest can offer more wisdom than she ever dreamed, her family continues to blossom and grow and carry her with them. And the chance at new love might just be waiting for her on that new porch. This isn't as simple a story as it sounds--Janie is bitter, not a paragon of gentle widowhood, there are complications aplenty from the many "good intentions" that crowd her life, and choices are not easily wrestled into order. Fans of Lolly Winston and Anne Tyler should especially like this book. This is a brutally honest book about living through the last few weeks of a terminally ill parent's life. Fierce love, fierce loneliness, self-centeredness, frustration, fury, exhaustion, bitterness, memories, too harsh realities--they are all here. Robin Romm is intensely brave and puts herself, and her family and friends, under the brightest of spotlights during one of the most difficult things a family can ever go through. It isn't pretty, but it is achingly true. There are no heroes in this book, only humans doing the best they can under the pressures that surround them. This isn't the kind of book you can "love" or "hate", but it is the kind of book you will be glad you read no matter what you think about it. This is the debut novel of Mun, and it isn't an easy one. At the age of 13, after her father left them for another woman and her mother went completely insane (she was already half-way there, but...), Joon decides that she would be better off on her own, on the streets. The book is basically 5 years of vignettes about the various situations she fell into. Most are not pretty, but Joon accepts them all without anger or much emotion at all--some of that is the drugs she's on, but most of it is the fact that she has never been valued in her entire life, so she doesn't expect it now. If anything, she becomes a collector of other people's stories, a witness to lives falling to ruin. The characters are always interesting, and the story is well told, if rather muted. I would never have picked up this book if it wasn't the top of the January IndieNext list. But I'm glad I did. The best way I can come up to describe it is that it's an unholy but frequently hilarious combination of The Sopranos and Scrubs. It's interesting (and frightening on some levels) that it is written by medical resident, so there are endless insider jokes and footnotes (yes, footnotes) regarding hospital behind the scenes stuff (very funny but it will make you avoid hospitals for as long as possible, trust me!). The main character is a former Mob hitman who is in the witness protection program and finishing up his medical training. It's hard to decide if he's a good guy now, or if he was a bad guy then, or really just what he is. He's certainly a colorful character, to say the very least. His past and his present collide when he walks into a new patient's room and the guy recognizes him from the old days. Chaos ensues. There is a Tarantinoesque scene at the end which will send the sensitive running for the bathroom, so be warned. It reads quickly, though it requires a somewhat jaded eye to truly enjoy. Fans of Palahniuk will love it. Our Bookseller Sarah C. shares with us today her observations on the best method on picking a children's book. Scattered throughout the article are some of Sarah's favorite picture books. Click on any of the pictures for more information about the books. First of all, with few exceptions, there are practically no picture books for children that are completely awful--that nobody should ever buy because no child would like it or get something out of it--and if you read to children much, you will have experienced the book you love to hate but that your child loves to have read over and over and over. And Over. It would be great if every book we read our kids was one we both loved. But really, every one of those thin, thin books holds a world of it’s own. Images meet words to make something completely unique that children explore with a freshness of eye and mind that adults can only remember. But there are so many of them and now we have a lot books that whistle, pop, spew little bits of cardboard out of pockets or light up, and it’s hard to get a kid to look at a plain old book: just a book with illustrations and a story that will become part of the mental furniture of our child, form long-lasting memories of love and pleasure, comfort and reassurance, or spark new trains of thought. It needs no batteries or moving parts because the moving parts and buzzing electricity are in the child. If you have no time and are on the fly, there are two approaches to take. Ask a staff member for a recommendation based on what you know about the child you’re buying for, or alternatively, what the staffer loves in the kid’s section. Even if we don’t spend much time in the children’s books area, we can direct you to the newest of the new and the old favorites--and there is a reason that certain books are old favorites: they’re kid tested over a long period of time. Or go with what’s on our Recommends shelf. Or look at the shelves and see what’s face out. 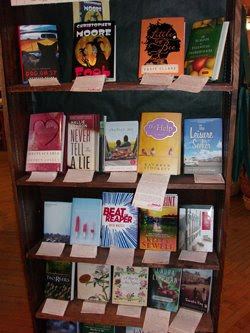 These tend to be new or award winning books that our buyer has decided we want a lot of of because they’re special. book by its cover--you need to sit down with it and give it a read or page through it. Look through those books and I’ll bet one or more of them will surprise you and look like something you’d like to share with a child. Books are expensive these days and no one wants to bring home a book that never gets opened or is used as a floor covering. Introducing a book to a child indirectly is sometimes a good technique. Sit down with a willing child near the target child and begin reading with enthusiasm and interest. At least five times out of six Mr./Miss Reluctant will sidle over and be engaged by the time you are done. Encourage interruptions. Answers questions and point out things that interest you. Bedtime is a good time to get a child’s attention. If your child can’t go to sleep without Goodnight Moon, read or merely page through the new book before you read the current favorite, talking a bit about what you see and what might be going on in the pictures. If she becomes curious about what’s happening, you’ve got her. Sit down and read the book yourself, right in front of your child. Make sure there’s room next to you though. You go to this site, you type in the name of an author, and it literally creates a visual map of OTHER authors whom you might like if you like the one you typed in. The closer to the author's name their names float, the more likely you are to like them. Sort of like an intelligent literary Magic8 Ball. I just tried it with "Jane Hamilton" since that's the most recent book I finished, and I got dozens of names, which interestingly enough included Dr Seuss and Ed McBain among others, though granted they weren't the closest names. So now, for me, it's begun a mind game trying to figure out just why these people are similar to JH. I can see hours being sucked in by this site--hours. Very entertaining hours, though. I found this through a blog called Good Books In Bad Times, which is an interesting site in and of itself.